loving sunshine agian and again. dreamt of government of Qing dynasty. :: in first dream worked for a young man in his water heat factory. he in fact a gangster entrepreneur, earned first bucket of gold from bloody business, like many succeeded youth in northeastern China, dogs rampant land. I tried to keep distance from the charisma who inspected old facility and made ambitious plan to renovate the steam heat system on a small hill. he tried to attract me over while acute in behalf of his blur dog business. then dream in a large space not likely family but my dad there, he is leaving for his work but concerned deeply my work. I assured him I busy with my websites even its hard with or without marketing. then I saw my website business contacting a Mandarin Primer in cyberspace. then I in another world found he, a Manchu, is actually Primer of Qing Dynasty in history. the Emperor of Qing Dynasty also appeared in dream but we didn't exchange many words. Its a sunny dawn, so I decided to cherish the golden moment to blog the dream. last night I talked to my kid brother, urged him to have another baby, as he want a daughter, as long as his financial situation supportive.I told him if he have another child I would less threatened by biocide from sinking PRC tyrant. I urged his mission to defeat our cousin, the first son of our blue collar worker uncle, a teacher, a dean then a bureaucrat like all worst communist cadre. my kid brother impels comparing him with the cousin as enemy, said the sin already failed for his 3 children, all boys, all unsuccessful in career. but I refute my kid brother's impatience, pointing to that one fortune changes anytime and never overlook sinister in preparing or guise, or on the wane. the night I felt harder to sleep, for I know changing matters occurs. God, I saw so many complacent in my site building. allow me to sustain the online service, as well as our diamond domains, to ever brighter scope in future. bring me sooner my Royal China to family me. bring me sooner my girls with our children. Dad,God, allow me more in ur shine. dreamt of hooligan. ::its a drizzling night while I didn't know the rain outside. I dreamt in dorm a hooligan borrowed my key to open other apartments. I don't want war against the beast so I tried to show him that my key is only working for my room, not compatible with any other room lock. I never allow my key left my hands till the hooligan left futile after my demonstration. the dream very vivid and urgent. when I woke up its 5am and I felt better note it on my mobile. I missed my breakfast after I woke up near 8:30am. its warmer in dorm but the drizzle, expected against everywhere catkins annoying eyes and noses, in time to clean the air. the past week I endured waiting as usual. more times I can't bear and laid down, and each time I napped soon. aging likely takes more and more my joy into enjoyable future glories. burning hope in gathering and social interactivity, boundless delicacies frequently unseat me. I knew my changing taste and away my presence. God, engaged me with fresh idea, committed me in task force, even in this adverse espionage sinking PRC tyrant exerted on us. God, dad, embed me in soil and grows dream of Holy message as usual. take me to ever new journey fills of bravery and consolidation. bring me sooner my Royal China to family me, dad, thx in raining. dreamt of journey again. :: first dreamt discussed talents' ethical standard with President Obama, and opposed his choosing of elite. then dreamt of being granted to fly with attendants. before aboard, among stewards and stewardess we moved packages onto the flight. its a honor to work with those young and beautiful people. till the jet launched, the session of dream ends. before I woke up I saw my 2nd elder sister gossiped me among our relatives.Its kind. last week I endured a lot before my Postal Saving Bank of China credit card arrives. God promised me it would be smooth so I just waited. till Friday noon I can't bear the breaking neck looking forward, after near a week, and visited QRRS mail office. a new guy there told me the mail address didn't include departmental detail so they denied the mail. he suggested me hurry to visit local postal office and if lucky enough to catch it before it retreats. it was not there when I checked in. the monitor, a mid aged man urged me informed card issuer to re-mail. but I lingered there till the computer operator, a younger woman extended her help and suggested me visit her next day. I left with gratitude. but in the afternoon I can't bear again and visited the woman in postal office soon. she disappointed and asked me check in next day as planned. returned to dorm rusty sadness so sick that put me asleep on bench in sunshine intact. managed to survive to Saturday, I finally fetched my first VIP credit card from postal office. it comes double: a common PSBC credit card well known for its no annual fee, and a gold credit card valid especially for 6 years. the credit limits not so impressive, each ￥15，000， but may suffice me. the outcome promised but turns so wilder with joy. with the financial tool, I probably better equipped to cop my debt and maintain lifestyle we enjoy. God, dad, I misunderstood credit some time. help me better adopt credit in coming years. grant us fruitful work and life with companion of credits which so graceful. bring me sooner my Royal China to grow and harvest. grant us a flight journey sooner to elevate our burnout in grudging reality in sinking PRC surveillance. thx dad, among so many positive changes these years happened on us. dreamt of graduation in dawn after son's birthday. ::dreamt gathering & cooked to celebrate our graduation. the meal includes fruits and porridge. Zhang Chongfu dispatched dishes to us.Huang Junyi and Yang jing happily what they gained in the final exam. even I seriously concerned my final score, which is 45 out of 100, but in fact I won the test to graduate successfully. some of my less lucky alumni, like a girl Fu Jing, 2 other guys hate school, only got a one digit score. yesterday is woz, my dearest son, birthday. I previously intended to linger in dorm which more and more accepted by me as my office. the morning is gloomy pale, after a sunny Sunday. 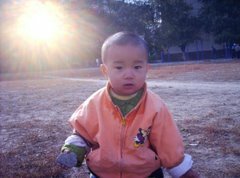 I look forward the sun appears again in clouds to sunburn my wet bed clothes, but it doesn't till I gathered my son and ate his birthday cake I bought him, in his mom's house.God urged me to visit my son on his 10 years' birthday. I grouponed a cake from a likely startup. the cake manually made by a young lady her own in a simple and a bit messy shop but its delicious. my son carefully put on all his 10 candles before we made snapshot advised by his mom. they reportedly will travel to Taiwan with their school delegation in coming summer vacation. I suggested my son using my credit card to buy himself ￥500 or more valued products from the dear island. his mom previously asked if I aid my son's tour, I replied I don't have extra money, but this reply of credit card sufficed her, for she just in lack of foreign credit card. she likely even doesn't know what a visa card looks like. In last week I managed a lot to enable our life easier. I purchased new VPN for woz independently using against more insanely brutal surveillance in sinking tyrant PRC. my application for PSBC credit card, my 4th, got passed and the card due to reach me in this 2 weeks. to celebrate the credit, which likely my first VIP card with largest credit quotation so far in my title, I purchased my son, Hope of China, God of Universe, a dell chromebook with touch screen facilitate his workspace experience as a pupil. the old dell notebook a bit too heavy for him and mainly used as a fix game console and online TV top set. so many good news intensified my nerves and exhausted me in weekends. So I had to ask for absence during game time with my son. he fought alone bravely in weekends online battle field. I even felt dizzy overnight in dorm, after I first tried Japanese style wine from a Japanese cuisine restaurant in downtown we lunched Sunday before weekly shower. God, my life here graceful. I can improve my life in China with lead of America. China doesn't necessarily abused like a hell or pitfall of sins and freaks, we can make it better on our won. dad, God, pl allow my son quality learning space and living standard in my custody. grant us swift move among debt barriers. bring me sooner my Royal China to raise my children, future of China.